In a large pot boil water for a pound of pasta. Salt the water when it begins to boil. Add the pasta and cook al dente. Drain the pasta and set aside but reserve some pasta water if needed for loosening the pasta later. Heat olive oil in a large saute pan over medium-high heat and add the garlic. Cook the garlic for only 1 minute then add the cut asparagus and cook for 3 minutes. 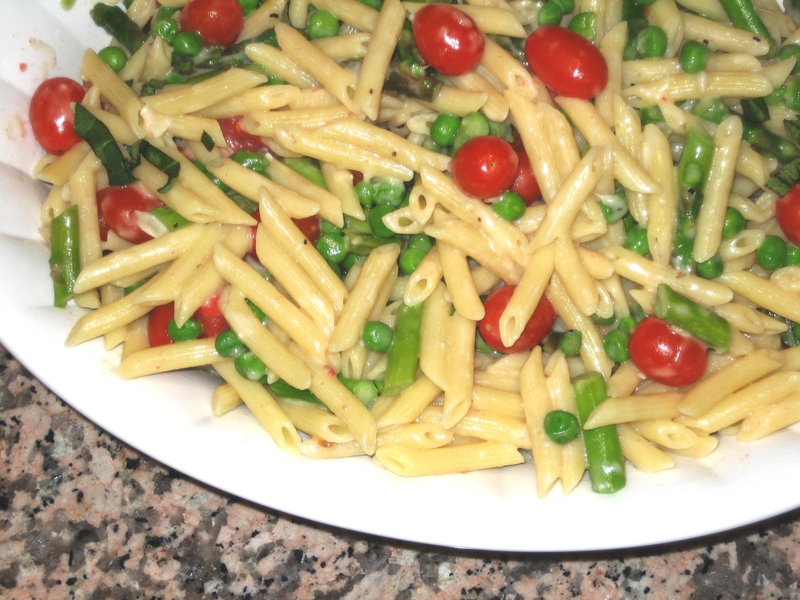 Season with salt and pepper then add the cherry tomatoes and thawed peas. Continue to cook for 2 minutes. After 2 minutes or so pour the chicken stock with the lemon zest and bring to a simmer. After about 3 to 5 minutes the tomatoes will look like they are going to start to burst. The stock should be reduced by half. Transfer the contents into the drained pasta pot and mix with the drained pasta adding any reserved pasta water sparingly if needed. Add 3/4 of the parmesan cheese and toss it all together very well but be delicate. Transfer to a large serving dish and garnish with the remaining cheese and all the chopped basil.